The 11th annual SVG Remote Production Gearbase Survey, which provides an ongoing database of production-truck technology for the North American fleet of more than 250 broadcast vehicles, is available at sportsvideo.org. 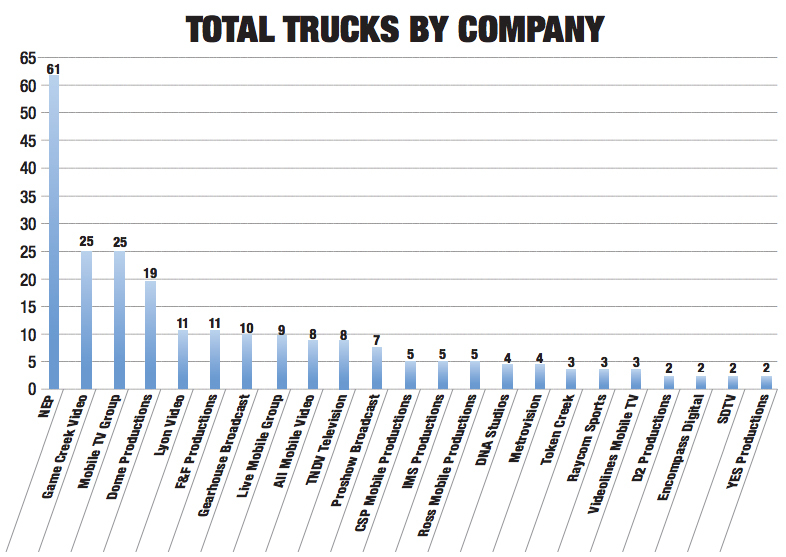 In addition to full equipment specs for 257 trucks currently on the road, the SVG Gearbase Survey includes a full summary of key findings in the North American truck market, including market share for major product categories like cameras, lenses, switchers, routers, replay systems, audio consoles, microphones, and graphics. The 2017 Gearbase comprises 257 total mobile units, only eight of which are SD. With SD all but dead and HD the status quo, 4K-capable trucks and units featuring IP-based infrastructure are on the rise. Of the 249 HD mobile units included in the survey, 20 are listed as 4K-capable, and 30 are 1080p-capable. This year’s Gearbase Survey drew more participating companies than ever before — 38 in all — and lists more than a dozen mobile units that debuted in 2016.